Following the success of the 2012 Winter Residency program, the Contemporary Sculptors Association is inviting applications from emerging and established artists for a 6 week Summer Residency at the Yarra Sculpture Gallery. Details of the gallery space can be found below. Please rank your preferences for spaces, if you have them, in your application. We will endeavor to accommodate your choices but cannot make any guarantees. Applicants will need to provide a CV, 5 images of current or relevant work (1MB max each image) and a 250 word proposal for the residency. Successful applicants would be required to join the CSA if not already members. Successful applicants who are current CSA members are required to pay $150 to cover rent and bills. Future members pay $210 Full / $180 concession - includes annual membership to the CSA. A $100 bond is required from all participating artists. This will be returned at the end of the residency, providing that the space is returned to previous working order. We don't police commitment or working hours and understand that everyone has different working methods, but our expectations are that you would be using the space for a minimum of 15 hours per week and will be available for the open studios. Has a projector and DVD player mounted and at your disposal. No natural light. Loads of hanging space on the walls. No natural light. May be split - east to west, into 2 spaces. Whole area has a lot of natural light, with more in the northern space. The southern space has a large roller door, with access via the side lane way. Steel roof trussers run north/south across gallery two and three. Sky light in the centre of the roof. 2 partitioned walls for hanging. Steel roof trussers. The YSG thanks the City of Yarra for their continuing support of the gallery. 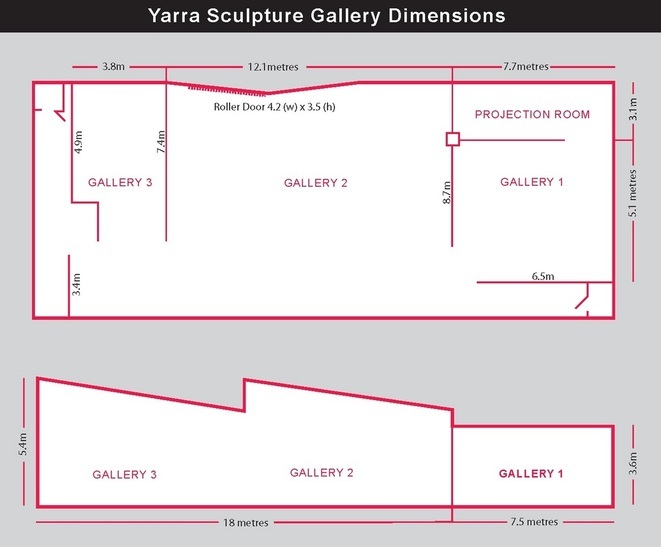 The Yarra Sculpture Gallery is run by the Contemporary Sculptors Association.